Teopanzolco is a Nahuatl word meaning in the old or abandoned temple. 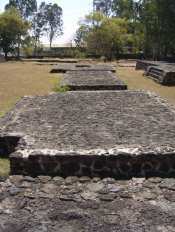 The ruins stand today in the city of Cuernavaca, Morelos, Mexico. The old city is mostly covered by the new, with the very center fenced off and protected. It is believed by many that this was once the centre of the main city of the Tlahuica people (note - this was a name given to them by their neighbours). Later, the main plaza would be moved to the centre of what is now Cuernavaca, where it was when the Spanish arrived. It's a mystery why the original location was abandoned, but today is does give us an insight into an earlier period which we may not have understood. It also gives us a glimpse into lies and intrigue that would later come to light with a shocking discovery. Today, the main structure is the large double pyramid, built in the same style as larger pyramids in central Mexico, such as Templo Mejor (in Mexico City). You can still see where the gods were worshipped, Tlaloc in the northern temple and Huitzilopochtli in the southern. Of course, there are two stages of construction here, one was never completed. Was it being reconstructed when the Spanish arrived, or was it started long before and never finished? The Tlahuica peoples lived in the modern state of Morelos, Mexico, settling in the mid-13th century. Their territory included about 50 city-states, and they developed a unique culture, though it had much in common with the other peoples in Mexico at the time. But it was destined to be conquered by the Mexico people, and take its place in what today is commonly known as the Aztec Empire. The Cuauhnahuac dynasty was an important one. Cuauhnahuac is the original name of the city of Cuernavaca, a name that was corrupted into its present form by the Spanish. The Cuauhnahuac kings intermarried with the Mexica and other groups in the area. This meant political alliances that rose and fell over the years. Motecuhzoma Ilhuicamina (Moctezuma I) was the son of a Cuauhnahuac king, and ironically he was the emporer that reconquered the city for the Aztec Empire. Did broken alliances like this one lead to long bitterness between the Mexica and Tlahuica? We do know that the city was heavily taxed. But no doubt there was a lot of animosity. People were taken to serve in the military or to build in the capital city, far from home and family. The structures were decorated with stone animal heads, and were at one time stucco-covered and brightly covered. 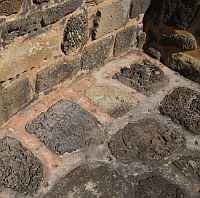 Several platforms are on the site, likely built as alters or for other ceremonial purposes. But the biggest surprise was to come with the excavation of platform #3. A mass grave site was discovered here, with 92 men, women and children. Many of the bodies were mutilated, and ritual utensils were found that no doubt were a part of a sacrificial system. Tlahuicas claimed that their ancestors never practised ritual sacrifice until they were forced to by the Mexicas. However, this statement made to the Spanish is brought into serious question with these findings. And perhaps, for all their differences, the Mexicas and Tlahuicas had more in common than was once believed. Learn more about Teopanzolco and other Tlahuica sites here. If you're ever in Cuernavaca, you can visit Teopanzolco for a few pesos, and wonder why the once-great site was abandoned so many years ago.